In magickal practice, the protection of one's sacred space and self is a vital factor in ensuring the safety and equilibrium of one's lower microcosmic being, home, and place of occult operation against psychic and corporeal intrusion of unwanted entities. The entities referred to here are the human and subtle sort--both have the potential of being equally nasty, troublesome, and satanic. In Esoteric Islam, Satan or "Syeitan" is understood as a universal characteristic of the lower worlds that may be embodied by sentient beings, and not as is commonly thought, an individual entity. The protection of a certain area within a magickal boundary could include offices, factories, warehouses, banks, etc. The first and foremost space that the occult practitioner would protect is the place called home, for aside from the physical body--the temple of the soul, the home is the symbolic and literal extension of the self, and the violation of the conscious self can be most traumatic. In occultism, practitioners would also never neglect to build a barrier of protection around an area of magickal working, not only to prevent the interference of external vibes and intelligences that disrupts the ritual-working but also to maintain the build-up of the invoked force--the "cone of energy." The "protective circle" of a magickal operation produces other important effects such as inducing the appropriate mind frame; the withdrawal of consciousness into the inner levels of the mind; the manifestation of an interface--a magickal portal between realities, etc. Apart from the protection of a clearly defined area, what may be considered of primary importance is the protection of the vehicles of the indwelling Spirit from psychic violation and damage, however, this is a subject in itself, and is outside the scope of this article. God/dess willing, we will probably deal with this later in a future paper. In this article we will focus on instructing several methods of deploying magickal barriers to defend a chosen area and the individuals living or working therein. The installation of magickal "fortresses" may protect one against psychic attack, black magick, fascination, hexes, obsessing/negative entities, physical intruders, thieves, trespassers, natural disasters, riots, (even the MIB, CIA, NSA, Big Brother, if God be willing :-) ) etc. Indonesian occultists refer to the art of magickal protection as "ilmu siker," and the protective barrier itself as "pagar gaib (lit. magickal fence)." One of the earliest Indonesian accounts of the protection of space may be found in the popular legend of Aji Saka. According to the tale, sometime in the early centuries after the advent of the Piscean Saviour, Aji Saka, a Brahman high priest from India settled in the Java island to prepare for a new race of inhabitants. He found the island in complete spiritual darkness, with the astral plane filled with effluvia and negative forces from the pits of the netherworld. It is believed that this noisome astral cloud overshadowing Java had its source from the Atlanteans who thousands of years before, settled in the area after the submergence of their homeland. They brought with them their magick and quite a number of their shamans resumed the practice of the black arts, releasing the demons of destruction. Functioning as a white magician, Aji Saka travelled all over the island to carry-out the monumental task of conducting certain rites and burying certain objects at especially selected sites to neutralize these forces, to Solomonically seal them, and to form a protective barrier that would keep other demonic intelligences at bay. His work was reinforced by the presence of Rishi Agastya, the great Seer from India, who came to Indonesia on an occult mission. What entities encounter while intruding a magickal barrier is quite fascinating. Depending on the method of protection and the techniques employed, physical intruders might come face to face with a veritable firewall, or they might hallucinate the whole area as being on fire. A different magickal programming might cause individuals penetrating the barrier with evil intentions to suddenly find themselves floating in a stormy sea with huge waves crashing upon them. The builders of these barriers are often amused to find intruders in the morning on the floor in their living room going through the motions as though they were swimming for life. We often hear of such reports from the paranormal practitioners in Indonesia and in the mass media. Sometimes thieves are caught dumbfounded, upon interrogation they reply that they just could not find a way out of the house--no portals of exit were to be found, so no getaway. We can infer from this phenomenon that the magickal force of protection constructed upon a certain area disorients the mind to an intense degree. It is not unlike the natural force that one may encounter upon ley or dragon lines and power spots which often induces an altered state of consciousness, causing one to experience a time lapse, dizziness, encounters with strange beings, enhanced sensitivity to impressions, and other psychic phenomena; however, where an artificial force-field is installed for protective purposes, the magickal barrier set-up by the practitioner is only activated by the negative force unleashed by unwholesome intentions and motives. Thus, under normal conditions, the power is not usually felt. Pertaining to the above, one interesting local belief is that roots of a special formation--triangular in shape with a hollow center--when hung in the house, especially near the doorway, may cause all exits to be overlooked by thieves during their nocturnal excursions. Some types of protection employ elemental familiars and khodams. Among the local shamans, the familiars often used for the purposes of security are entities presenting themselves in the forms of tigers and hairy giants. These familiars acting as gargoyles, guard the premises from unwanted visitors. Those who are bold and ignorant enough to penetrate the defined area of protection under their jurisdiction, would encounter these protective spirits in their most ghastly, terrible aspect. Rest assured, the protective familiars do not harm intruders physically, they just traumatize their victims and scare the living daylights of them--and they do their job significantly well. If a tiger familiar is employed, sometimes their growls may be heard. The guardian khodams, in contrast to the elemental familiars, might give subtle warnings to trespassers before appearing as stern, authoritative figures. These warnings may be felt as fear, or pangs in the conscience. These types of spirit guardians also produce visual and auditory hallucinations in the minds of thieves in a manner that they see fit. They might even cause would-be intruders to fail to see the protected house at all! Above we have stressed what physical intruders might experience in a magickally protected area. What do negative spirit entities experience when they enter or attempt to penetrate such an area? More or less the same thing. They would feel or sometimes literally see whatever thoughtform or entity we employ in the protective process. Magickal barriers of light structured with Divine Names and sacred verses, and imbued with spiritual force are tangible to spirits and may cause them burning sensations as they collide with the occult shield. We have had an interesting experience in this regard : One night, feeling a little psychically uneasy, we decided to protect our room where we slept with a firewall. In the middle of the night, something awoke us and shifted our conscious self to our subtle body.We literally fell, astrally speaking, out of the bed in that state; and on the floor there was lying a menacing-looking entity. Out of reflex action, we gave it some offensive strikes. But it was immobile--either "dead" or unconscious--perhaps the result of colliding with the fire wall. The entity had the form of a crocodile with human legs. In local shamanism, this type of entity is classed as a siluman--a water sprite--specifically a "buaya siluman" (crocodile sprite)--one of the nasty types that are said to drag unwary swimmers or bathers into a watery grave. Near our home is a river and this is probably where it came from. What it was doing in our room we could only speculate. Finding it to be without life, we flung the creature outside of our premises. End of story--or so we thought. The next night we were astrally called to confront a horde of other buaya silumans in the depths of the river. They swam towards us, with legs bent in a certain manner, eager for combat, hoping to avenge the death of their companion. We braced ourselves for the conflict, ever hoping to avoid it, not because of cowardice, but because of boredom and the desire for peace. All of a sudden, out of nowhere, a group of dolphins (!) came to engage themselves in the conflict against the silumans, leaving us idle and a little bewildered. The latter quickly dispersed. Ever since that event, we were never troubled by the crocodile-men again. One night, many years ago, having neglected to put up a barrier, we awoke in our subtle body, to find a snake struggling to make its way into our foot. Our psychic sensitivity announced us to this occurrence. Being only half-way in, we pulled the tail and flung it away without giving it a second thought. Things like these happen often in Indonesia, especially when one practices occultism. Black practitioners are fond of sending such creatures out of malice to harm others, perhaps out of jealousy, and sometimes to simultaneously test the inherent power and occult capabilities of their victim. Sometimes this act is commissioned by a rival in business or an "enemy," with the objective of the physical elimination of the victim. We have known someone who had a similar experience but failed to prevent the snake from entering into his leg, the result was that he walked with a limp until the etheric snake was removed. Our researches through the Net has made us aware that the problem of psychic attack is also widely practiced and experienced among the occult communities of the Occident. Human nature is the same everywhere. Several years back we had an entity sent to us by a black shaman because of our involvement with the healing process of one of his victims. This entity could not enter our room because of the psychic barrier that we set-up. Outside the barrier it displayed menacing gestures hoping to intimidate us. We thought nothing of it, confident that the fortress around our room was strong enough to withstand its onslaughts, and indeed, after that night it never returned. Skeptics might consider the above experiences as dreams, delusions, or concoctions of the subconscious mind, nevertheless, they were lucid experiences and a legitimate part of the shamanic reality. Occult practitioners and ordinary laymen, the religious and the non-religious, the pure and the impure, encounter these occurrences quite often. Magick and occult practices are widely found in the Indonesian archipelago. Every tribe and ethnic group have their own brand of magick. Balinese magick differs in form from the Javanese. Sundanese occultism called, "Buhun" also is a magickal system all of its own, just as the tribal magick of the Dayaks in Kalimantan (Borneo) and the shamanism in the Celebes and Sumatra. Encountering occult forces, psychic attacks, black magick etc., are common occurrence in this ancient land believed to be a fragment of the submerged "Lemurian" continent and later an Atlantaen colony. It is, likewise, for no lame reason that some local practitioners believe Indonesia to possess the densest population of nature spirits, jinns, and elementals. It is almost impossible to live one's life here daily without interacting with these entities at some level of awareness or to find oneself unknowingly and involuntarily clashing with some black practitioner or chosen to become a victim of its malediction. Having said the above, we are also aware that the western culture is expanding tremendously its horizons on a wider circle in its perceptual realities of non-physical origins with a more scientific basis and paradigm. As alluded to above, there are various methods of protecting space with several types of familiars employed, each with their own special way of producing the wanted effect, and degree of efficacy in either warding-off human or spirit entities, or the forces of malediction, psychic attack, and black magick directed to a target. What we are implying is that one method of protection might be effective in shielding-off physical intruders, but not as effective in warding-off negative energies, etc. To optimally protect an area, the magician would probably employ two or three methods, depending upon the circumstances. Protection employing the use of khodams requires one to previously acquire a khodamic familiar and by assigning it the desired task. Magickal protection by the elements make use of thought-forms charged with spiritual, pranic, and elemental energies--mostly of fire and etheric light.. Nature-spirit protection employs the invocation of certain elementals, nature spirits or artificial, constructed servitors. Divine protection employ the recitation of sacred verses, prayers, and Divine Names. The mechanics and nature of the latter method of protection, and the effects that they produce are not normally realized by the practitioner--they produce variable effects sometimes employing the other forms of protection. Succinctly--in this method we simply submit ourselves to the Divine Intelligence, having faith that all is well. Magnetic Protection utilizes cosmic-pranic energies and the thoughtform-building process to produce barriers or servitors. Most methods of protection employ a combination of the above. The methods taught here are derived from Ilmu Hikmah, or "Islamic occultism." We will not explore or instruct the use of all possible types of protection, as these may also be found in other readily available sources. This is to be conducted on a Thursday in the compounds of the place to be protected. Fast the whole day from dawn to dusk. At midnight recite the Throne verse below for 313 times. This is a Divine Protection method. 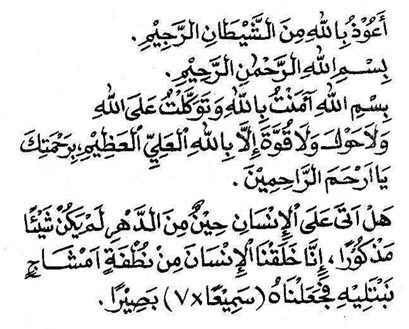 It would be beneficial to recite this every night for 170 times as it also results in other spiritual benefits. You might also want to utilize a material base for this prayer-recitation. Appropriate the house protective items sold in our site for this. Recite the Throne verse 33 times as in the above. After every single recitation, blow upon the object 3x to consecrate it. Visualize the energy of the prayer flowing with the breath and into the objects. See them aglow, pulsating with light and life. Repeat the procedure for the other objects. Consecrate the items in this manner and bury or hide them in the 4 corners of one's home or the cardinal points of one's magickal circle, or hung above one's front door if a single object. This operation is very effective but requires hours of work--it protects the home against all negative entities, physical and non-physical, as well as psychic attack, black magick, etc. The effects of the two methods here are permanent. What intruders will experience as a result of trespassing the premises--only God knows! This method employs the above prayer in conjunction with pranic powers. The period of this protection does not last as long as the first method, but it is easier to conduct. Repeat this rite every 2-3 days. First offer a personal prayer of thanks to the Highest and state your intent verbally for the construction of this invisible fortress against all negative entities and forces. Then accumulate psychic energy in any way that you are accustomed to. Or you might want to take deep breaths and hold them for about 30 seconds and then exhale. Repeat for several times. The next step is to once again inhale and maintaining the breath while mentally reciting the Basmallah and Throne verse (1x) given above. Then exhale while projecting a stream of luminescent energy from your hands and constructing a circle of energy around the protected area. Build this circle by moving clockwise. Reinforce the power of the barrier by repeating for an additional 6 times, making 7 in all. See the circle fully formed, alive with power.When the first phase of the operation is completed, begin the next phase by imagining the circle forming three-dimensionally into a sphere, enclosing the protected property. Affirm that the operation is completed. Inscribe the magickal design below upon a virgin piece of paper with consecrated oil. Make four copies of it. 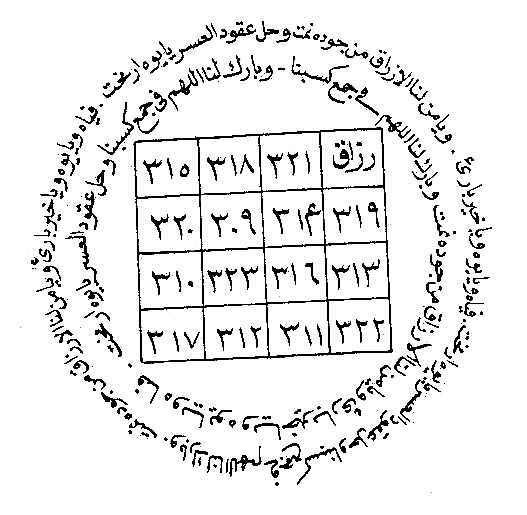 Be sure to follow the rules of Al-Hikmah talismanic-making (If God be willing, we will explain this in a future article). Fold the 4 talismans while stating a personal prayer and intent of the operation. Then insert each of the talismans into previously sanctified bottles. Seal the bottles and bury them at the four corners of your home. This will offer protection against intruders, thieves, etc. While in the premises they will hallucinate a horde of ants attacking them and make a run for it. This method of Divine Protection calls upon angelic assistance. "AWALAISAL LADZII KHALAQAS SAMAAWAATI WAL ARDHA. BIQAADIRIN 'ALAA AY-YAKHLUQA MITSLAHUM BALAA WA HUWAL KHALLAAQUL 'ALIIM. INNAMAA AMRUHUU IDZAA ARAADA SYAI-AN AY YAQUULA LAHUU KUN FAYAKUUN. FASUBHAANAL LADZII BIYADIHII MALAKUUTU KULLI SYAI-IW WA ILAIHI TURJA'UUN." 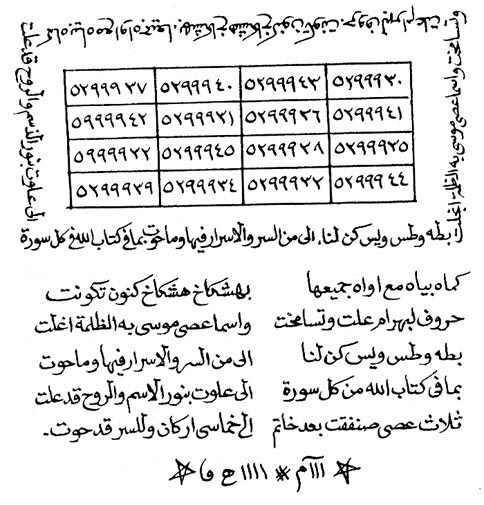 A simple method to stop thieves from stealing and even entrap them is to inscribe the talisman below upon a virgin piece of paper and to place it underneath your pillow as you sleep. The combined power of your Divine Self and the force imbued upon this talisman causes the creation of a servitor with a forcefield that would disorient the mind of any intruders. They would fail to find an exit. Say a personal prayer of protection and state your intent after completing the inscription. Another simple method is to inscribe the talisman below upon a piece of virgin paper and to hang it above your front door, preferably on the eastern side of the door. Any intruders will hallucinate the premises to be a stormy sea. Say a personal prayer of protection and state your intent after completing the inscription. To protect the place with a familiar spirit, first acquire one, then instruct it as to its task. See article on Ilmu Khodam or to acquire an elemental tiger familiar see Sima Samboa Tiger Familiar . After the recitation blow upon the lock 3x visualizing it being charged by the energy of the prayer. The following talisman not only protects the premises but also brings blessings. 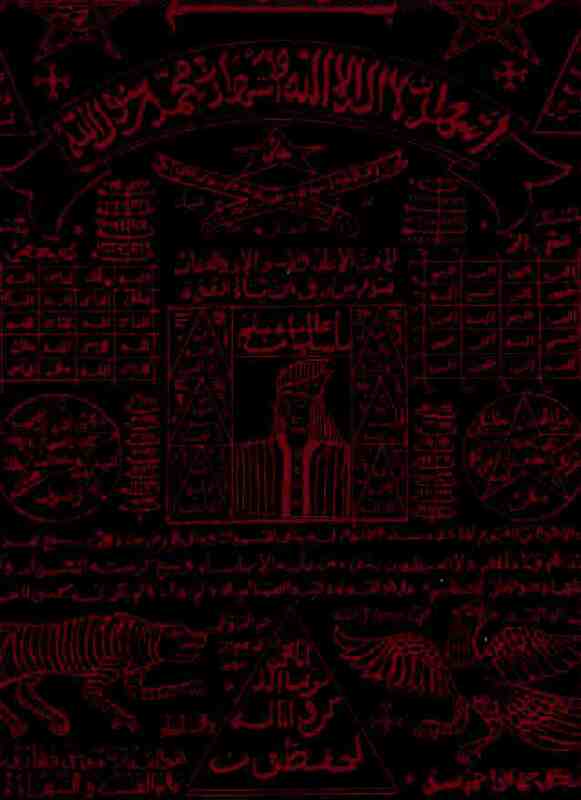 Inscribe it upon a piece of virgin paper in accordance with the rules of al-Hikmah talisman-making. Say a personal prayer of protection and state your intent after completing the inscription.Then pin it up above the front door. Then recite the prayer below 99x. After each recitation blow upon the talisman, charging it with energy. Visualize power from your breath flowing to the talisman and impregnating it with the divine force of the prayer. See in your mind's-eye the talisman pulsating with light and life. After the consecration hide the talisman in a corner of the place to be protected. Note: Deer-skin in itself, is said to possess magickal powers and is a wonderful medium for talisman construction. After the recitation inscribe upon a piece of virgin paper the verses below and hang it above your front door. This method evokes a troop of khodamic beings and assigns them the task of protecting the premises. This rite consumes several hours of work. "WA JA'ALNAAMIM BAINI AIDIIHIM SADDAW WA MIN KHOLFIHIM SADDAN, FA AGH-SYAINAAHUM, FAHUM LAA YUBSHIRUUN." If it pleases God, by this method, so long as the tree branch lives and grows, the premises will always be protected against negative influences. We will offer here two other talismans said to be effective in warding-off or entrapping thieves and intruders. Construct 4 of each talisman on pieces of virgin paper. Offer a prayer to the Highest and state your intent. Then place them in bottles and bury or hide them at the four corners of your home. First conduct a holy wash. Then stand outside of the premises while offering a general personal prayer of thanks to the Highest and state your request of protection. Then encircle the premises anti-clockwise while reciting, "Ya Huwa" 1511x. Do not speak to anyone while doing the chant and defining the area of protection. Aside from the simple chant above you may also use the "Umar Farouk Shalawat" prayer. The method of use is as the previous. First recite the basmallah verse followed by Umar Farouk. "ASSALAMU 'ALA MANIT-TABA-AL HUDA AMMA BA'DU FA-ANNA UMARUL FAARUQI RADHIALLAHU 'ANHU. ALLAHUMMA ROBBANA ROBBUHU ROBBUKA ROBBIKI ROBBIHIM WA ROBIHINNA IHDINASH SHIROTOL MUSTAQIIMA." Recite the prayer over and over as you encircle the premises 7 times. The items below are talismanic media of protection sold on our site, constructed with the appropriate mystic designs, sacred verses and symbols. They are semi-charged and may require additional force or prayer-recitation from the User for optimal function. Charge them with any of the prayers/techniques given in this article. There are many techniques of protection in both the Eastern and Western traditions. It is our hope that this article would fill the existing vacuum regarding the lack of information on Islamic occultism and its methods. May the practitioner of these teachings be blessed!